I am back to blogging after a week's break. Hope you're all doing good. Last week, I experimented many dishes in my kitchen but I didn't have time to take photos of the dishes I cooked. Hopefully, I will be preparing them again for my blog. 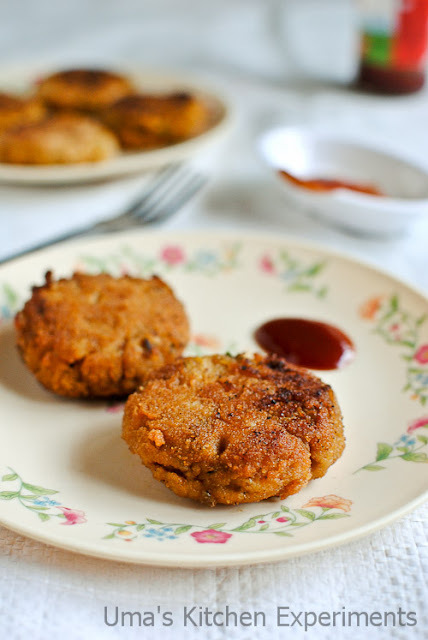 Today's recipe is Cutlet with Soya Chunks. 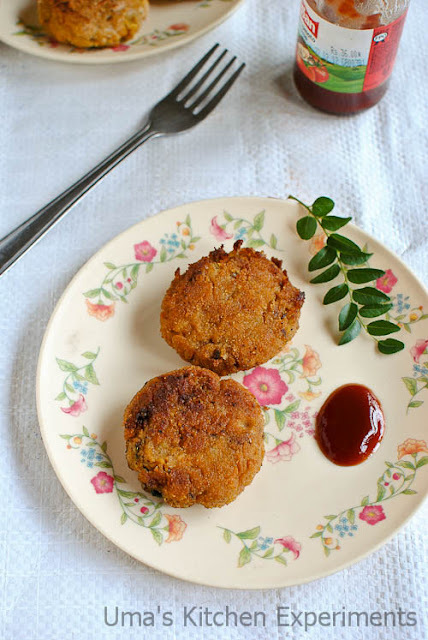 I like these soya chunks cutlets because of its easy preparation. They are very soft inside and crispy outside. I prepare them mostly for potluck parties and get-together. I go for deep frying when I need to prepare this recipe for a large gathering. If you choose deep frying method, it doesn't require any precooking like we used to do in vegetable bread cutlets. Simply mix all the ingredients, make round patties and deep fry them. Sometimes, I prefer shallow frying method when I prepare this dish in small batches as it requires precooking and takes little long time. This time, I shallow-fried all the cutlets and hence sauteed the mashed potato and soya chunks mixture with masalas. Now off to the recipe. 1) Wash potatoes and pressure cook or boil them. Once done, peel the skin and mash it well. Meanwhile, add the soya chunks in the boiling water with a pinch of salt for 15-20 minutes(or cook as per the package instructions) and squeeze out the excess water. Mash it using fork or grind it in a mixer. Squeeze again the excess water. 2) In a pan, heat oil. 3) Add cumin seeds when it is hot and allow it to crackle. 4) Add the onion, curry leaves and saute till onion becomes soft. 6) Add red chilli powder, coriander powder, chat masala, dry mango powder, turmeric powder and salt. Mix well and cook till the raw smell of masala goes off. 7) Add the mashed potato and soya chunks and give a quick stir. 8) Continue cooking till the mixture looks thick and water free. Allow it to cool for a while and make round patties out that. Arrange them in a plate. 9) In a small size bowl, Mix all purpose flour and corn flour and make a medium consistency batter by adding water. 10) In another bowl, add the breadcrumbs. 11) Heat tawa/pan. When it is hot, dip the patties into the flour mixture one by one to make a coating and then make a coating of bread crumbs. 12) Put them in the hot pan and cook till the side are slightly turned brown. Flip to cook other side. 13) Repeat the procedure for the rest of the patties. 1) You can also pressure cook soya chunks along with potato. If you choose the pressure cooking method, make sure to squeeze out the water from the soya chunks completely. Otherwise, you can't make patties. 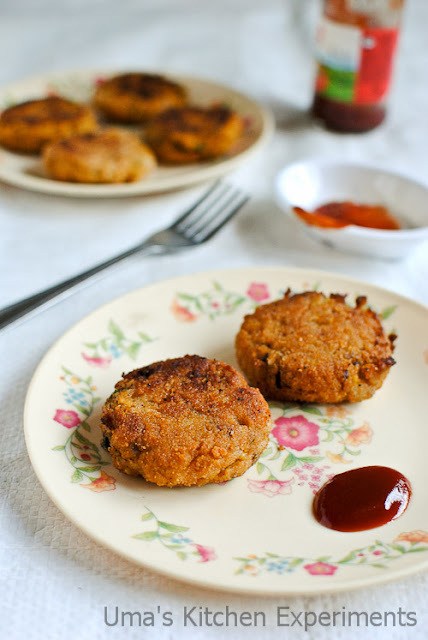 2) Make a coating of batter and breadcrumbs just before frying the patties to get a crispy crust. 3) If you choose the deep frying method, simply mix the boiled potato, soya chunks and other ingredients and start making cutlets. No need to precook the ingredients as said above. 4) I used the large sized soya chunks. Soya chunks are also known as Meal Maker and Nutela. Nice recipe n pretty pretty clicks! 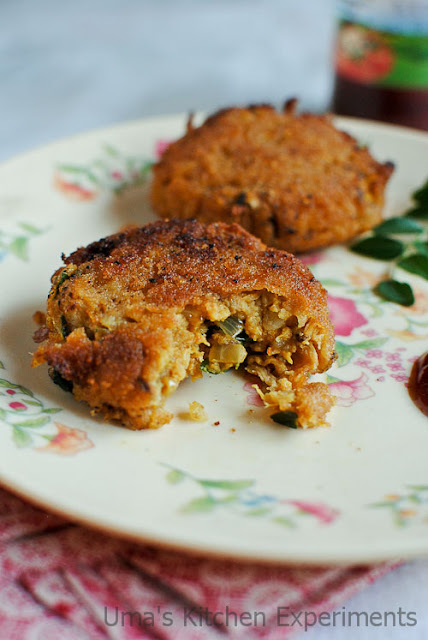 one of my fav cutlet...loved your version, cutlets looks so yummy...very good pics Uma! 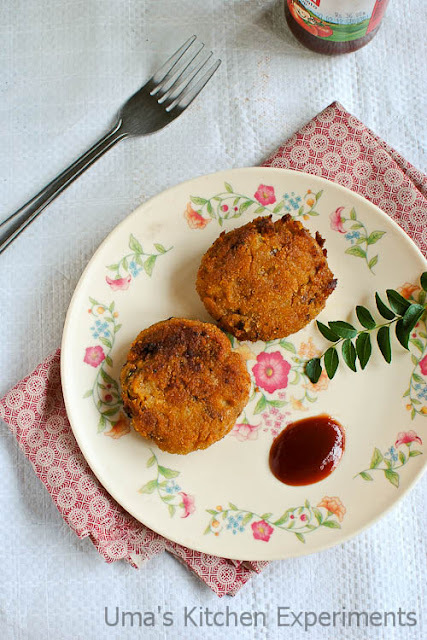 Yummy crunchy cutlets.. Nice pics..
cutlets look crispy and delicious... yummy..
yummy pan fried soy recipe.. looks so yumm n inviting..
it was in my to do list for long time.. have to try it..